THis Uneeda biscuit container doubles as a bank when all the cookies are gone. Tin lid has a slot to deposit your coins for a savings bank. 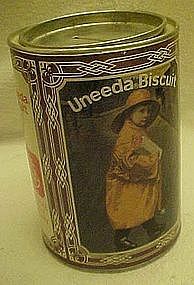 Advertising logo of the vintage raincoat girl carrying the tin of uneeda biscuits. Measures 5 1/4" tall and is in excellent cndition with no damges at all. 1985.